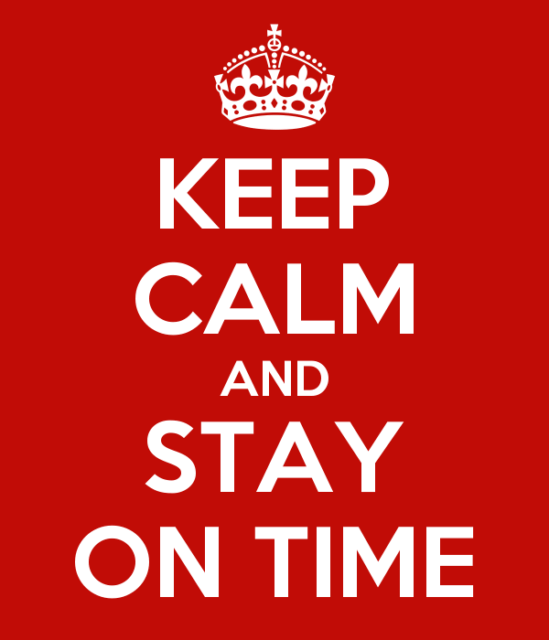 Stay on time! Though it’s clearly sensible to keep a conference running on schedule, we’ve all attended meetings where rambling presenters, avoidable “technical issues”, incompetent facilitation, and inadequate logistics have made a mockery of the published program. It’s unfair to the later presenters and sessions. Participants don’t know what the actual schedule is. Chaos and cynicism follow. Meals and breaks are abbreviated or, in extreme cases, eliminated. In particular, there are a couple of ways in which out-of-control schedules can wreak havoc on sessions. I’ll illustrate them with examples from a presenter’s point of view (mine). A client asked me to run a 75-minute interactive session on participant-driven and participation-rich meetings at a daylong conference. They scheduled me for the last session before the closing social. During lunch, the A/V crew asked the two remaining presenters to check our slide decks were ready to go. I did so, and noticed that the other presenter did not. You guessed it. When the afternoon sessions began, the entire 150-person audience sat around for twenty minutes while the first presenter fiddled around trying to get her laptop to project. She then added insult to injury by exceeding her allocated time, with no correction from the conference organizers. When she was finally finished I asked if we could run late so I could get the session duration I’d planned for. “No, sorry, you’ll need to shorten your session by twenty-five minutes,” was the reply. Experienced presenters are able to creatively improvise in response to last-minute changes to their environment. However, losing a third of my time with no notice was a challenge. I did a good job, but had to omit the major exercise planned for the session. The resulting experience was less impactful than it could have been. Ultimately, the attendees are the losers when this happens. They don’t know what they missed — and, of course, I don’t come across as well as I might deserve. Here’s another less obvious way that chronic lateness can sabotage a session. A client asked me to facilitate a 90-minute workshop for 600 attendees. It was scheduled as the last session of the day, in a distant ballroom separated from earlier sessions by a five-minute walk. With a scheduled 30-minute break before my session, there was plenty of time for participants to get to my room. The session required extensive set up, so my crew and I worked solidly for three hours to get the room ready and rehearse our workshop tasks. But when it was time to start, no attendees appeared. We waited for 30 minutes before people began to trickle in. Clearly, the entire day’s schedule had been running severely behind all day. Luckily, an organizer told me I could still use my full time for the workshop. That was a relief to hear. Hundreds of people were standing as I was about to start. But then the conference owner arrived and asked to present an award first. He made a short introduction of the recipient, who embarked on a long, rambling thank-you speech. I’ve run this workshop many times, and in the past when I’ve announced this requirement (“If you have to leave before [finishing time], I’m sorry but you should not participate in this workshop”) typically two or three people leave. To my astonishment, hundreds of people — two-thirds of the room — left! Dumbfounded, I nevertheless knew that the show must go on. It was a great workshop for the folks who remained. (No one left when it was over; they simply sat and talked with each other for at least ten minutes before anyone left the room. And several people came up and thanked me.) But I was disappointed and puzzled that so many attendees had missed out on an excellent experience. Obviously, I wanted to find out why. But first we had to break down the room set, and by the time this was over the attendees had dispersed. At breakfast the next morning the reasons for the mass exodus finally became clear. The morning program sessions had run over so extensively, that the organizers slashed the lunch break to 30 minutes. Since lunch was not provided at the conference that day, many attendees didn’t have time to eat any lunch at the restaurants nearby. The afternoon sessions also overran, so the organizers also eliminated the scheduled 30-minute break before my session. When the hungry and exhausted attendees appeared in my room, only to be asked to attend my entire workshop in its entirety, the proverbial straw broke the camel’s back and most of them walked out. As a participant, I would have probably joined them. From my perspective as a presenter and facilitator, I’m not sure there’s much I can do when others cause truncation of my contracted sessions or fill them with hungry, tired attendees. Perhaps a contract clause that doubles my fee if the session starts late or my available time is slashed? Regardless, the moral is pretty obvious. Stay on time! That goes for everyone: conference organizers, emcees, facilitators, presenters, and attendees. Ultimately this is a matter of careful planning, firm and effective time management, and simple respect for everyone who spends time, energy, and money attending and producing an event.